Thousands sold all around the world. 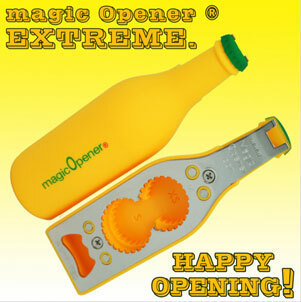 magic Opener Extreme, Now with 4 ready-to-use sizes. Now mO Extreme is ready to open the most common FOUR sizes of plastic bottle caps, without any assembly. Just find the cap size you need to open; XS – S – M or Standard, insert, twist and WUALA… your bottle is open!. It will now open most of your water bottles from Costco, Walmart, and most convenience stores, all plastic soda bottles, aluminum soda cans, pull tab soup cans, traditional glass bottles and more – like the Original magic Opener but with the added benefit of a pet and soup can opener, and with 4 plastic cap sizes – ready to use! It is magnetic and ergonomic. Not sold in stores or anywhere else. ONLY AVAILABLE ON OUR WEBSITE!!!! Special order inquiries by phone are welcome. 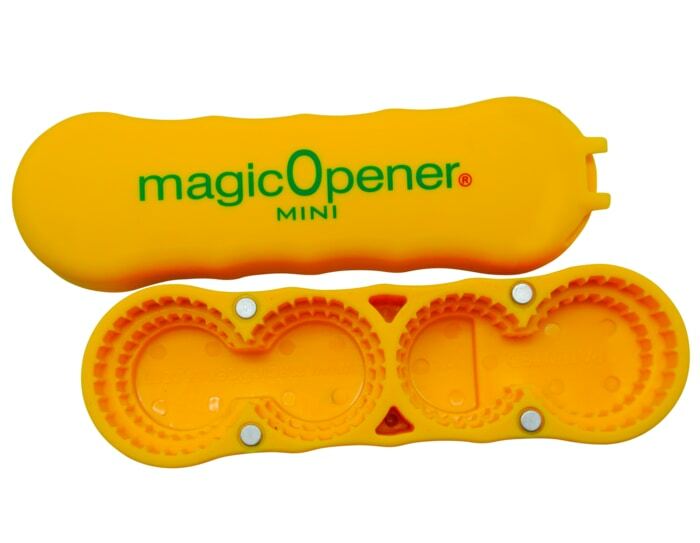 The NEW magic Opener MINI is now available to you. 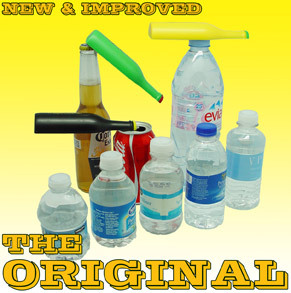 Yes, you can open any regular bottle of water and soda, with a small, medium or standard plastic cap. Any water bottle from Costco, Sam’s, BJs, Wal-Mart, CVS, Walgreens, any Supermarket, any company. Any soda bottles no matter if it is 12 oz. - 16.9 oz – 2 liters or any aluminum soda can. Easily will open soup and pet food pull tab cans effortlessly. You can try it for a full 90 days. If for any reason you are not completely satisfied, you can send it back and we will refund your money, no questions asked. 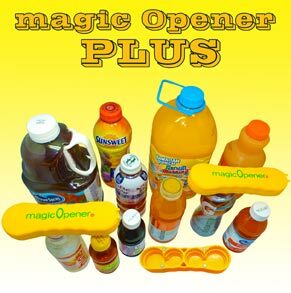 magic Opener COMBO is a great help for those in need to open various sizes of caps on all different plastic bottles easily and comfortably, from the eco-friendly smaller caps of traditional water bottles, to larger Vitamin Water or Gatorade caps, and most sizes in between. A total of 16 different cap sizes for your convenience. Ergonomic and magnetic for easy access when needed. It is made with a strong and resistant material, made to last. Also includes a can opener for soda cans and larger food can pull-tabs. Available in yellow. Includes 90-Day Money-Back Guarantee, no questions asked. 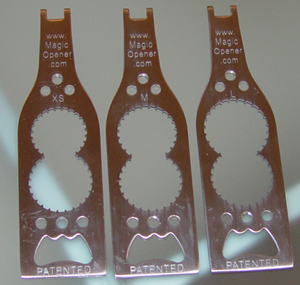 magic Opener PLUS is the ideal bottle opener for larger plastic bottle caps. Easily will help you opening bottles like all sizes of Gatorade, Tropicana, Powerade, Ocean Spray, Sobe, Vitamin Water and many more alike. 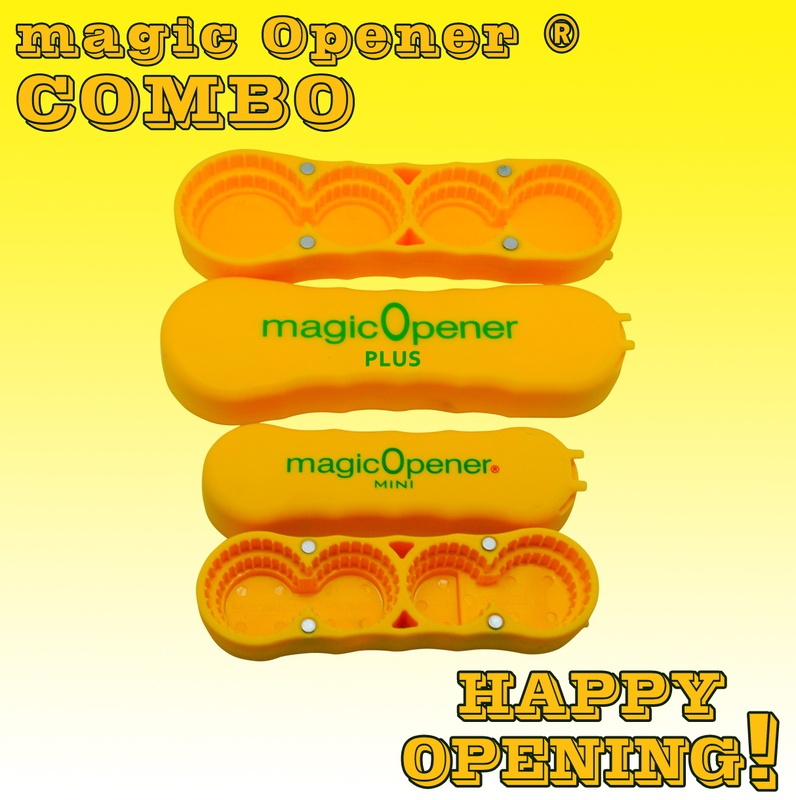 magic Opener PLUS is Soft and comfortable for your hand, it is available in yellow. Get it once, have it right. You can use it for 90 days and if you don’t like it for any reason, just send it back for your 90 day money back guaranteed. 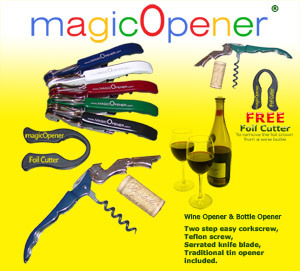 Two magic Opener ORIGINALS are better than one -- upstairs & downstairs, home & office, indoors & outdoors, keep one & give one away, and on and on -- there are so many reasons to get more than 1 Opener. FAST, FAST, FAST, Very FAST. 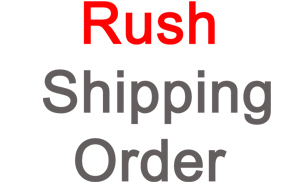 For only an additional $3.98, we will process your entire order and have it in the mail within 1 - 2 working days. PLUS, if your order is of 3 or more OPEN SESAME(S) easy bottle opener, your order will be shipped Priority Mail, which typically arrives within a few business days after processing. With FREE Foil Cutter included! Two step corkscrew, Pull tap's Premium Classic Corkscrew. Contoured alloy molded handle. Teflon spiral. Micro serrated blade and traditional glass bottle opener included. BEST SELLER, Super Value ! 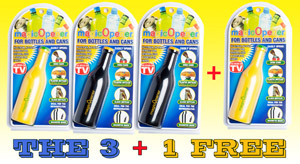 You receive 4 magicOpener ORIGINAL great cans & bottle openers for only $59.97 -- You'll never be without the perfect cans & bottle opener -- home, office, car, purse, RV, boat, etc. 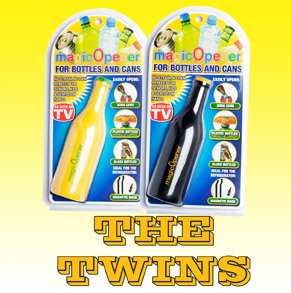 Besides bottle openers for your own use, how many people do you know who might benefit from an easy-to-use, easy to store and find, simply the best cans & bottle opener on the market? The Open Sesame opener makes an especially thoughtful gift for family, friends and neighbors,. It's a great gift idea for so many people on your list, for so many occasions. Your Magic Opener comes with the most used twist-off caps size installed. However because water bottles has so many different twist-off cap sizes, if the one installed is not the right size of your favorite water bottle, then you can order the set of 3 interchangeable plates to replace the plate for the most appropriate size XS – M – L - So you'll be able to use it all the time with your favorite brands. If you don't have your extra Interchangeable plates as yet, you can order them here. Once you get them, follow instructions and you'll be set injust a blink of an eye.